Bec Boop is a fashion / beauty / travel / lifestyle blogger (Bec Boop), and social media influencer on many platforms. I initially connected with Bec Boop on Periscope (of course!). She typically scopes from London taking viewers (known as the #booptroop) to various events. She is famous for her daily “Coffee Scopes”. She virtually takes the Boop Troop with her during her world travels. 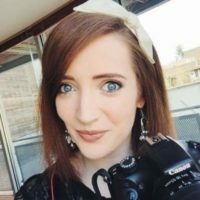 Bec has been blogging for about 4 years. I went back to her “Welcome” post and learned that it was time for her to pursue her “passion for fashion”. Today she is very well known in her field. Bec just began a collaboration with accessories fashion designer Lulu Guinness and Digital Audio Broadcasting (DAB) radio / audio brand VQ. Collaborations such as this is what all bloggers dream of! Bec works very hard on her blog and is so deserving of this. I see this in so many successful bloggers. So for all you new bloggers out there (including ME), never give up, get your story out there.